The Town of Ithaca is situated on the hillsides surrounding the deep valley occupied by Cayuga Lake, one of Central New York State’s Finger Lakes, and Cayuga Inlet. The topography, shaped by past glacier action, is rolling hills with views across the lake and narrow stream valleys leading to the lake. Two dominant hills, South and East, are home to Ithaca College and Cornell University respectively. Deep gorges and forest-clad wooded hillsides mix with urban development. At the foot of the lake, surrounded by the Town of Ithaca is the City of Ithaca. Population growth in the area is moving out from the densely developed city into the town. The effect on each quadrant of the town is notable. The northeast’s remaining space for development is a wooded area adjacent to Cornell’s laboratory of Ornithology. Nearby Cornell farm fields offer views and relief from the development. Dramatic development has taken place in the southeast area around Ithaca College. On the hills south of this development and Ithaca College open farm fields remain. Wooded gorges and hills are protected by Buttermilk Fall State Park. into the city area than in other quadrants. Numerous farms offer open space and views. From all of the corners of the town there are great views as one descends the hills in to the city, but development has and continues to threaten these scenic views from well-traveled roads. The volunteer committee has visited, photographed, and inventoried all the town scenic sites that are available to the public. They have developed a grid map and criteria for evaluating the views. These views have been ranked with particular attention to the need for protecting or the opportunity for enhancing them. 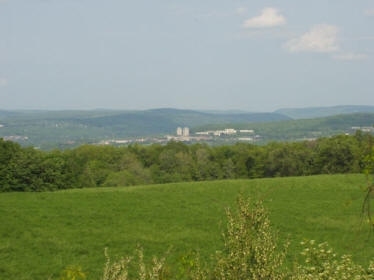 The top ten sites selected can be found on below under the Attachments Section, as well as an executive summary of "Saving Ithaca's Views," a report of the committee's work up to January, 2008. The entire report is also available for download below or may be obtained from the Town Clerk at Ithaca Town Hall. A scenic tour map is also available, with directions for a route around the Town's ten top scenic locations. Now that this report has been favorably received in Town Hall, the committee is working at getting its recommendations implemented. The following recommendations from "Saving Ithaca's Views" were presented to the Town Board on January 7, 2008. Require that building permits identify trees and woodlots to be preserved.